The Beat is described as a sparkling floral woody fragrance; the notes feature bergamot, mandarin, Ceylon tea, cardamom, pink pepper, bluebell, iris, white musk, vetiver and cedarwood. It starts very bright, with tart fruit and juicy citrus. There is lots of pink pepper (can anybody remember what perfumes smelled like before pink pepper became obligatory?) and a teensy little pinch of cardamom. The heart is sheer bluebell-ish florals, still very bright; the base is cool and pale and summery, and smoothed over with a smidgen of iris. The ad copy calls The Beat "carnal, slightly wild", but that is the usual nonsense — there is nothing even vaguely carnal about it. It smells young and cheerful and clean, and is a pretty good match with the mood of the print ad. There is also an "Elixir Parfum" version. It's a richer scent, with a heavier concentration of iris (you can smell the iris as soon as you spray it on) and a deeper, smokier tea note. The bluebell is there but less prominent, and the base, while still largely pale and cool, is warmer and earthier. It isn't carnal or wild either, but nor is it young and cheerful and clean. I spent some time listening to the music that Burberry reportedly gave to perfumers Dominique Ropion, Olivier Polge and Beatrice Piquet to get them in the right mindset for The Beat (Kasabian, Dirty Pretty Things, Razorlight, the Arctic Monkeys and The Fratellis). It is par for the course, I suppose, that the music is far edgier than the juice they came up with? Presumably they're hoping to reach a wider audience than you'd get with a fragrance that evoked Dirty Pretty Things' Gin and Milk, and I shouldn't think anybody was going to go looking for edgy from Burberry anyway. Instead, they've gone for likeable, and they've hit that right on the nail. The Eau de Parfum is youthful without loading on the strawberry candy (it doesn't smell like it's aimed at 'tweens), and while I wouldn't call it massively interesting, it's nicely done and a good fit with the Burberry aesthetic. I don't love it, but it didn't kill me to try it and I wouldn't mind smelling it all over town, in fact, I'd much rather smell The Beat all over town than any number of things. I found the Elixir Parfum considerably more tempting, in fact, it might be the first Burberry fragrance I've ever wanted to own. If you've been looking for a mainstream iris and found Prada's Infusion d'Iris too sheer and Bvlgari's Omnia Amethyste too pretty-charming, you might want to try The Beat Elixir. You know that a brand capable of making beige plaid covetable is going to do decent packaging, and Burberry has come through on that score as well. The packaging is way cute. I like the Beat Eau de Parfum bottle (shown above), shaped like a hip flask and etched with a Burberry plaid design, just fine. It's easily as cute as the Burberry Brit bottle. The Elixir bottle (shown at right) is even more way cute; it's small enough to actually carry as a hip flask, and the plaid pattern is done in a metallic silver finish. I wanted one as soon as I saw it in person. I might just have to buy it. 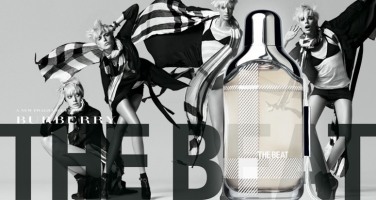 The Beat by Burberry is available in 30, 50 ($62) or 75 ml ($80) Eau de Parfum or in 40 ml Elixir Parfum ($130); the body products include Shower Gel and Body Lotion. The Burberry boutique in my local mall had only the Eau de Parfum (and only in one size); Nordstrom had the entire range, including the Elixir. The Beat is expected to go into wider distribution over the next few months. I haven't seen the 30 ml bottle anywhere, and guessing that will be Sephora only? Oh, that Elixir bottle is utterly wantable! Robin, do you know what the little tube thing at the side is? It's A Burberry name tag. The bottles look great in person, too. I think I need to get a sample of pink pepper accord just so I know what's being talked about every time I read a women's fragrance review these days! Burberry's recent packaging really is great, though I'm not sure I like the flannel-wrapped Touch bottles. The Brit bottle is fantastic, and so is this one, but I'm with VanillaGirl in terms of wondering what that weird dangly thing is. I looked at the Burberry website for a better view and it doesn't really help. Strange. I think Burberry does a good mainstream job; I love both the men's Brit and London. One question: Was women's Brit Red (and also the Sheer) just limited edition? It's not appearing on the Burberry or Sephora websites anymore. Oh Thank You for reviewing this!! I went to the mall Friday and asked about it, the poor SA hadn't even heard the name yet (!) just knew a new Burberry was coming soon. I love the elixer bottle – it's just too cute! I had to laugh – that line about making beige plaid something to covet is so true, THAT”S good marketing! *I'm with Joe on the pink pepper though, would like to smell it on it's own to know what I'm “looking” for! Yes, both (Red and Sheer) were limited editions. A fragrance targeting the youth market without being overly sweet, fruity and pink is already a huge progress. Pink pepper isn't mango or lichee! I too think, Burberyy is doing a good mainstream job here and successfully modernizes it's brand. I'm really curious to try The Beat. That's a really cool bottle indeed! Am quite interested to try it out, am pretty curious about this tea + iris combination. Am not sure what bluebell or pink pepper smell like though…. I've been wearing it since Friday and the pink pepper was off putting at first. I'm coming around to it. I like the general warmth of The Beat, and the mandarin note. The bottle *is* cute, but the sueded cord attached to the tag gets dirty quickly; I wouldn't leave it out. Robin — there's a Burberry store here, and I get all those cute bottles mixed up. Do you like any of them? Or, what I mean is, do you think I'd like any of them? I like my share of mainstream scents (D&G The One and Light Blue, Hilary Duff, Amethyste Crystalline). I am bored with the pink pepper (is it the new litchi?) Would you describe any of them as sultry? I'd like to go sniffing but want to narrow the field down a bit. Something about the font makes me think “The Beatles” when I look at the bottle. Looking at the advertising, it may not be accidental. (Does it remind anyone else of A Hard Day's Night?) Hey, I love a good Beatles reference, myself, so no complaints here. Absolutely. A very retro feel, and I'm sure the reference was deliberate–looking back to swinging-60s England. The typeface itself resembles that of more than one of the Fab Four's album covers. Both this one and Brit are well posed to reap advantages from Americans' fondness for England and for the time in question, even if those buying the scent are too young to remember it. Yep, a little suede tag hanging down w/ a metal name tag that says Burberry. Is pink pepper not ubiquitous on the men's counter too? I didn't even realize. It is everywhere in women's fragrance these days. Also didn't realize Touch was done up in flannel too, thought that was just London — will have to check that out. Yep, Brit Red & Gold were both LE. Guessing Sheer is too but will have to check. Agree they generally do a good job, although I didn't much care for Burberry London other than the bottle. It wasn't bad, just didn't interest me. I think only Nordstrom has it so far, is that where you were? IIRC, coming to Saks & NM & Bloomies, then maybe more stores another month after that. The official launch isn't til March I think. Bittergrass, the tea is rather subdued in the regular. I've no idea what bluebell really smells like, only know it from Penhaligon's Bluebell. I love the Prada too, but I know many people found it too light. The Elixir is worth a shot! Bet you're right that it will get dirty quickly on a fragrance counter. Thanks M! And should have added to the above: haven't tried the entire line, so if you find a sultry Burberry let me know! The closest I've smelled to sultry is Brit Gold, but it wasn't entirely sultry and I don't think you can find it anymore. Burberry fragrances are nice and wearable if not edgy but for what they are, they deliver. The line is yet to launch a frag I'll go wild over, though Brit comes really close (both the juice and the great bottle – I thought the men's was the lovelier) as does the violet/musky Touch. I really liked the women's Brit, especially in EDP. Which is your favorite Burberry, R? Mrs. Williams, it has a very mod feel all around, so wouldn't be surprised if that was an inspiration. Thanks Dusan! The Beat Elixir is easily my favorite of the Burberrys I've smelled, but I've missed a few in the line and haven't smelled ANY of the men's at all. The women's Brit is nice, and so were the flankers, just didn't feel the need to own them. Of course! “The Beat” is short for “The Beatles” (they just ran out of room on the bottle). Ooooh…I'm going to have to wait for this one to come to my local Bon Ton (which could be a really long wait) before sniffing it, but I'm kind of excited. I'm a pretty big Burberry fan, for whatever reason- maybe it's the nostalgia the ads bring around. Either that or I need an excuse to act snobby and wearing a British (sort of) perfume makes me feel like I can do that. This looks interesting though. None of the men's? My advice is you can start backwards and easily skip the original Burberry and Weekend altogether. Sorry, I meant London regarding being wrapped up in that silly flannel “perfume cozy.” And it's the men's London I liked; not sure about any of the women's products though a coworker wears Brit Red and it seems pleasant enough. As for pink pepper… maybe it is there in a lot men's product too, but it doesn't seem near as prevalent as when I read descriptions of women's scents. In any case, I need an “Accords for Dummies” sample set or something. Very “Swinging London” look to this campaign. I have never heard of this Agyness Deyn, but when I see these ads all I think of is some vintage Jean Shrimpton or Twiggy photo layout. Also wanted to second March's compliments on your new blog logo. Aha, thought London might be the only one wrapped in fabric. And hey, if you find that sample set I need one too! LOL — it has been a long day here too, as it turns out. I'm NEVER going to catch up on women's, much less men's! But I'll see if I can't try a few Burberrys. I think most people who cannot afford the actual designers pieces of clothing or accessories, can sometimes afford the perfume. They always make generally feminine or easily worn perfumes for that reason…I never expect much from these brands, but they are nice perfumes. LOL at “excuse to act snobby” — a good enough reason to buy The Beat, I guess! Nah, the same old Belk's. Small town living is nice for raising kids, not so hot for shopping! LOL! Hey, aside from last year's London's (original) flanker, there're like, 5 masculines in total if I'm not wrong… minus the first forgettable two I mentioned up there you've only got 3 to smell, LOL! Speaking of, let me know when you try EA White… in your own good time of course. does anyone know what song they used in the short advertising video they made for the beat that you see on the burberry website? Yes! lol I'm keeping my own in a closed cabinet. I've tried it once; it's waiting for a second try. Was surprised how much I like it given that it's in a genre I don't usually care for. Still think it probably can't stand up to something like TM Cologne, but we'll see how it fares on subsequent tries! Sorry, I've no idea. They don't give many lyrics to go on, do they? “That's alright…it's alright” was all I heard. Yay! It's the top notes that I find the most addictive in EAW, and while I like the creamy musky dry down, it can get a tad loud at times. Still, it's definitely a favorite. Agree that TM Cologne is lovely and I'm surprised now that I don't even have a decant! Oh no, she's cooler (and better fed) than Twiggy. I like the way the ad plays with the beat era and swinging London. But the bottle is a crossbreed of the CK one bottle with a mobile phone IMHO. I know the feeling! The only decent mall near me is 40 minutes away. It's the Arctic Monkeys, isn't it? (The one I listened to was, anyway.) Don't know which song it was. You need a travel sized bottle at the very least, I should think! N, could be, I don't know the band well enough. i hear the song right now! even the bottle fits to this 60s stuff, i think it is pretty nice. but the answer to the question: waht was the first perfume with pink pepper has not been answered yet. i knew first gucci no.2 as a pink pepper stuff. what do you think about burberry a a brand? what kind of renommee do they have in the US? in germany it is more for the elder, golf players also for young wannabees. imho it is just: british and nice, decent. And not that I actually find IdI and OA too little and too much, respectively, at all!! It's just that, given that I like both of those very much, The Beat Elixir sounds double intriguing — triply, Robin, since it's your favourite Burberry. High praise, indeed! Gosh, no idea what the 1st scent with pink pepper was. It's been around for awhile, but lately seems to be in absolutely everything. Burberry used to be considered stodgy, but no more — now they're pretty hip. Well then hope it will live up to it! Makes me think, again, that Prada really needs to do a deeper flanker for IdI, which in many ways is just a more interesting scent. P.S. I like L'Occitane's Iris, too, dammit!!!! Does NOBODY else??? IIRC, Infusion d'Iris has not yet appeared at the discounters, but eventually it will, I should think. I'm sure SOMEBODY else likes the L'Occitane, LOL, but it isn't me! I thought it was fine, just didn't care about it much either way. Hiris, as you already know, is a great favorite though. So do I — they did a really great job. Can't argue with that. Did you try the Elixir? I bought this fragrance yesterday in Paris (not available in my country yet), this “little thing” at the side is a small metal label on a cotton string. Looks nice, dangles when you handle the bottle Nice scent anyway – sweet and woody at the same time. Great buy ! I went to a Nordstrom fragrance festival today and The Beat was the star of the show. A vice president of Proctor and Gamble spoke about it and I was amused that the main thing he discussed about beat during his speech was its cute bottle and the iconic Burberry plaid. I own it, but I have to say that it's not exciting–I bought it because it was light and I didn't have anything else that light, and there were no notes that offended me–and has terrible staying power! Half the effort, if not more, goes into the packaging — so not surprised that was the focus. I liked the Elixir much better than the regular. As is usual for me, this one had beautiful top notes and the dry down hurt my feelings. It had a very powdery finish that just didn't jive with me. I washed it off as soon as I got home, about two hours later. It's a shame, too. The bottle is precious. I got a hold of this one while a SA was throwing samples at me one day ( My sister and I had been bugging her for the last half and hour to pay us some attention and look into her wonderful sample drawers, please) while she was trying to get rid of me. I have a soft spot for Burberry anyway, because it was them- Burberry original, in fact- that first clued me into this blog and perfume. Happily, I fell a little bit in love with Burberry. I would certianly like a bottle and find I have to ration my sapmle. The only other sample I've had to ration was Chanel Chance. I'd like both, but if I had to choose, I'd probably take the Chanel and shed a few tears over the Burberry. Either way, it's rather lovely…and I can't help but love the ad. The ad is great, and congrats for getting an SA to throw samples at you! The Chance is probably easier to find at discount, so I'd probably take that too. Yeh i liked the add too. Also ilove the new smell its like musky but fruity! Pink Pepper is the extract from the pink (or red) berries of the Schinus Molle tree. These so-called “false” peppers are used in decorative peppercorn mixes; and in the last 15 years or so, the extract has become popular as a novel peppery note in perfumery. Yes, pink pepper is listed in the Glossary here under the french term, baies rose. Thanks so much, I’ve been waiting for that!